The art of musical and theatrical entertainment held great importance in Renaissance courts, and those who distinguished themselves by improving or inventing new instruments would certainly have attracted a lot of attention. In the manuscripts we come across not only relatively simple musical instruments like the mechanical drums but also innovative, complex ones like this Musical Cannon, drawn on folio 136 recto of the Codex Arundel now in the British Library in London. This machine is extremely complicated. While the drawing is not very detailed, the basic idea is quite clear. 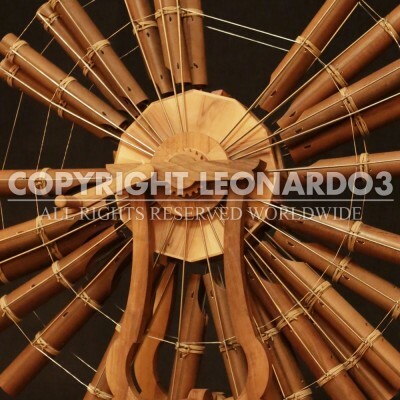 Leonardo intended to build a wheel upon which four teeth would simultaneously strike thin plates meant to emit a sound inside a pipe serving as a sound box. The wheel would be activated by an operator who simply had to turn the crank. 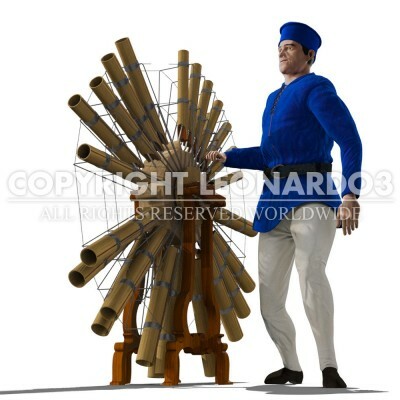 The movement of the wheel and the consequent passage of the four teeth would produce polyphonic music (4 teeth = 4 voices), in which each voice would keep following the others like in a canon; hence the name given to the machine, which is a play on words referring to the “musical canon,” the pipes (canne in Italian) that distinguish the machine, and a sort of “cannon” that fires music instead of bullets. Here one could build a wheel using programmable rollers (like those of a music box) with a melody in the form of the canon. I instead will make just one wheel with 4 teeth so that each of these teeth reproduces the music of each of the 4 voices.